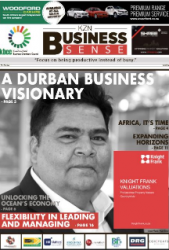 In just 10 years Durban business visionary, Pran Shree, has transformed a small family business into a mega property development enterprise, optimising property solutions for a host of blue-chip clients. Shree, CEO of Shree Property Holdings grew up in a family business and has been involved in it since the age of 14. Shree said that he had sought much inspiration for his career from his father and his mother, who were both entrepreneurial by nature. He continued, "My personal drive was fuelled by need for job creation and observing the impact it had on a single employee being able to feed a household." "My wife Annisha and I grew our retail butcher into a wholesale meat business, then we increased our cold storage business into a large storage facility for citrus for six months in a year. During our off-season period, with the unemployed staff component of 250 people, and being supported avidly by Annisha, together we founded our business, Shree Property Holdings in 2007," said Shree. The property development company, specialising in warehousing, property management and construction solutions, has quickly going on to become an award-winning enterprise in South Africa's construction and development sector. He said that the most prized highlight of his business life is working with his family. Shree says, "I not only get to be a husband and dad, but I get to share my professional life with my wife and children. When I wake up in the morning, I get to chase my passion and spend time with my family." He further commented, "Working in a family business has added to our success as we all focus on our strengths and it enhances the business as a whole. Since we are a family run business, this ethos spills over into our company culture, and as a result our staff members are also treated as family and team players. I was exposed to a highly autocratic leadership style and implemented this in my own business but once the younger generation joined the business, I saw how beneficial a democratic leadership style was." Shree commented that in order to remain an employee of choice, "It is necessary to adapt to diversity and transformation by enabling mentorship and sharing my knowledge and experience." He said, "Today I can proudly say I have a hand-picked team that has the necessary skills, knowledge and personalities to operate my business and complement its culture." Growing the business was not easy in its early stages. Shree said, "When I founded my business in 1984, as an Indian businessman, it was difficult as I was not participating in a free market environment. The secret to my success lies simply in the fact that I am highly passionate about what I do and as a result am able to work hours on end without realising the time." The company's meteoric growth trajectory has marked it as an enterprise committed to delivering high-quality products in a competitive market as is indicated by the fact that it sells integrated solutions, rather than mere products. Shree said, "The impact created by business sustainability is for us not only to manage our triple bottom line, but to implement a green initiative strategy through our product offering, that shall ensure the longevity of our business. The opportunity arose for us to invest more initial capital into our buildings making them green rated and equipped with solar panel systems and water conservation systems etc. This is massively demanded by blue chip clients looking to achieve their own business sustainability. When not working, Shree enjoys cycling and jet skiing. He concluded, "I also enjoy spending quality time with my wife and children outside of the business. My wife is my best friend and confidant. As a family we enjoy travelling together and of course, my most expensive hobby is my love for sports cars."